The adorable city of Yountville, California is the home to one of the most acclaimed restaurants in the world, chef Thomas Keller’s The French Laundry, as well as numerous other delicious restaurants. Last week I had a fantastic lunch at Bouchon (read my review here), the casual French inspired bistro also owned by chef Thomas Keller. Another fantastic restaurant in this quaint town is Redd serving New American cuisine. The chef, Richard Reddington, used to work at other great restaurants in California such as Jardiniere in San Francisco and Auberge du Soleil in Napa Valley. 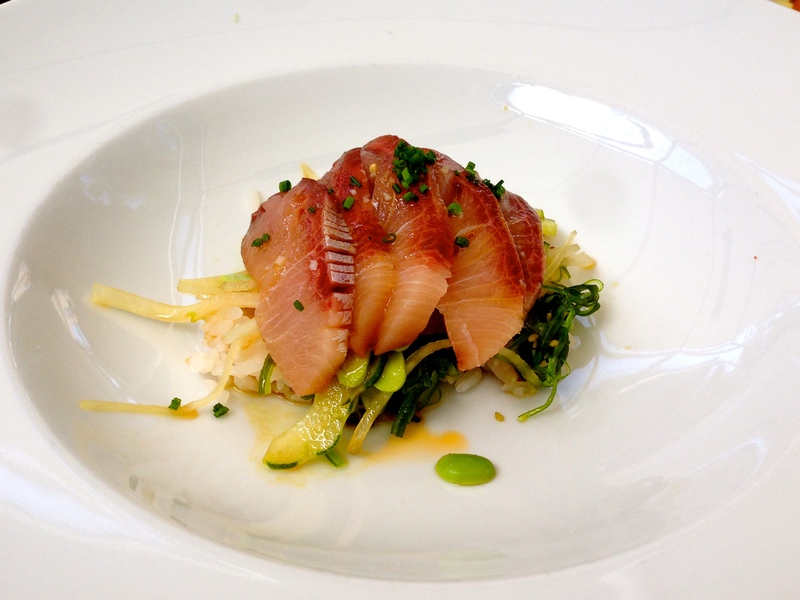 His menu reflects Californian cuisine with international influences. Hamachi Sashimi with Sticky Rice, Edamame, and Soy Ginger Sauce (8.5/10). 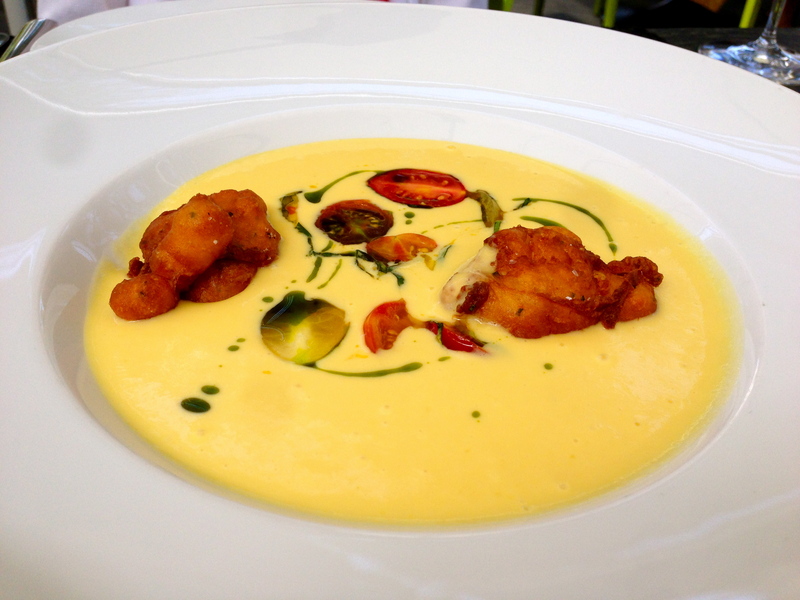 Corn Soup with Corn Fritters and Baby Heirloom Tomatoes (8/10). Asian Style Chicken Wings (8/10). 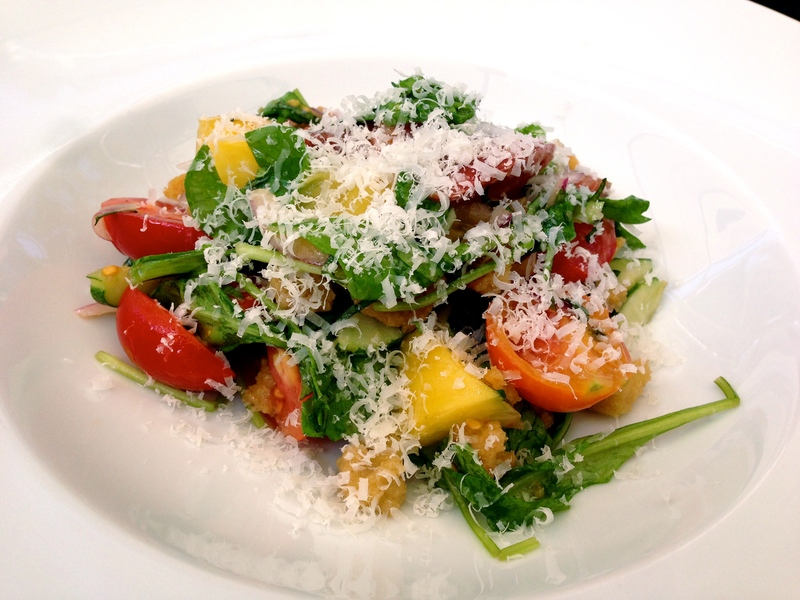 Garden Heirloom Tomato Salad (7/10). 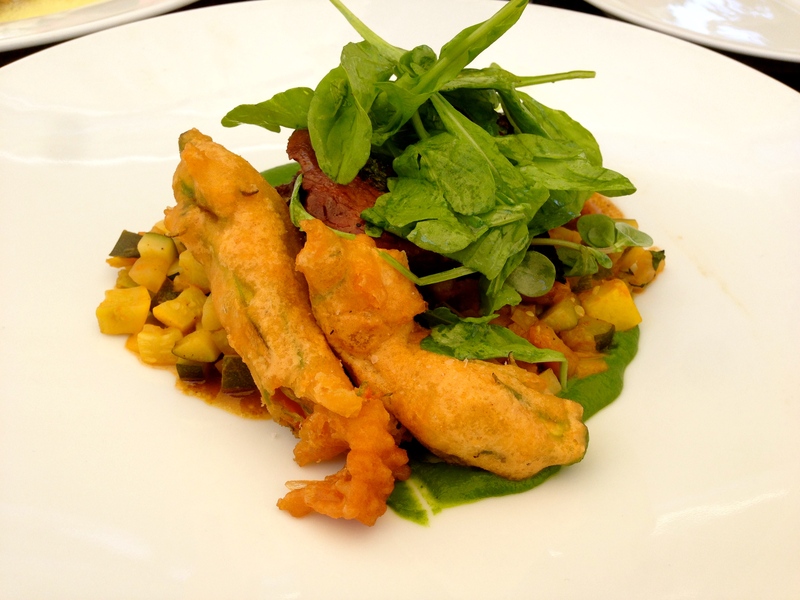 Lamb with Fried Zucchini Flowers and Vegetables (7/10). 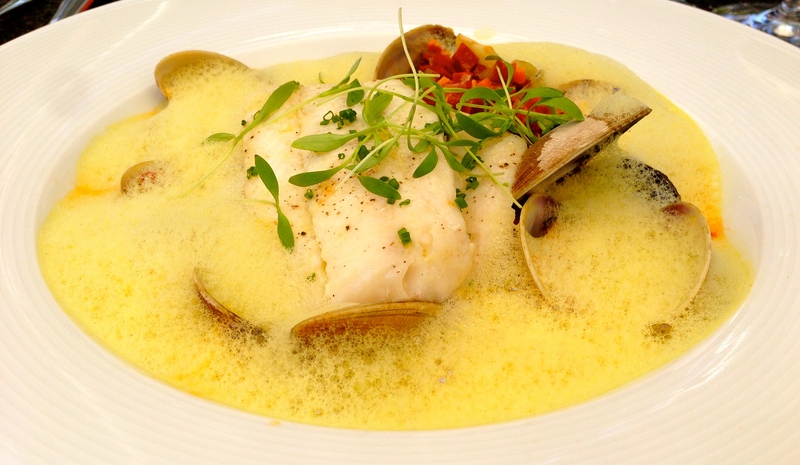 Sole Fish with Clams and Chorizo (7/10). 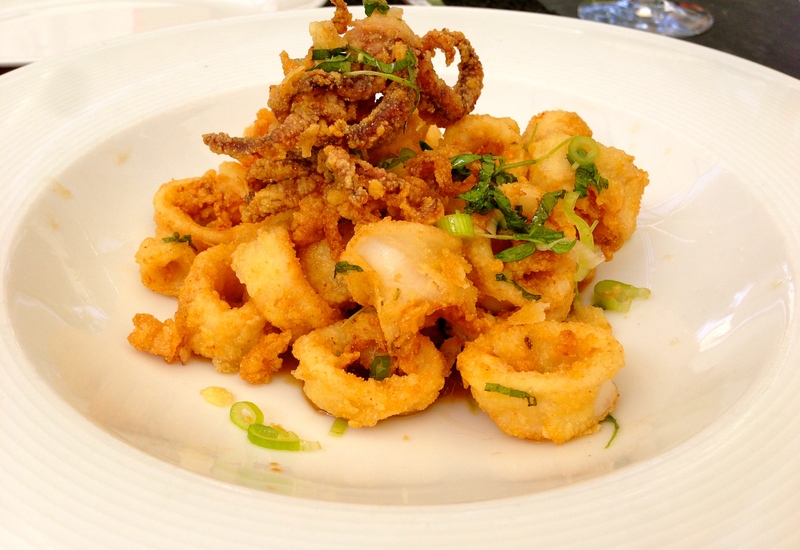 Redd is the perfect place to enjoy lunch in beautiful Yountville. The food is fresh, vibrant, and perfectly reflects Californian cuisine. 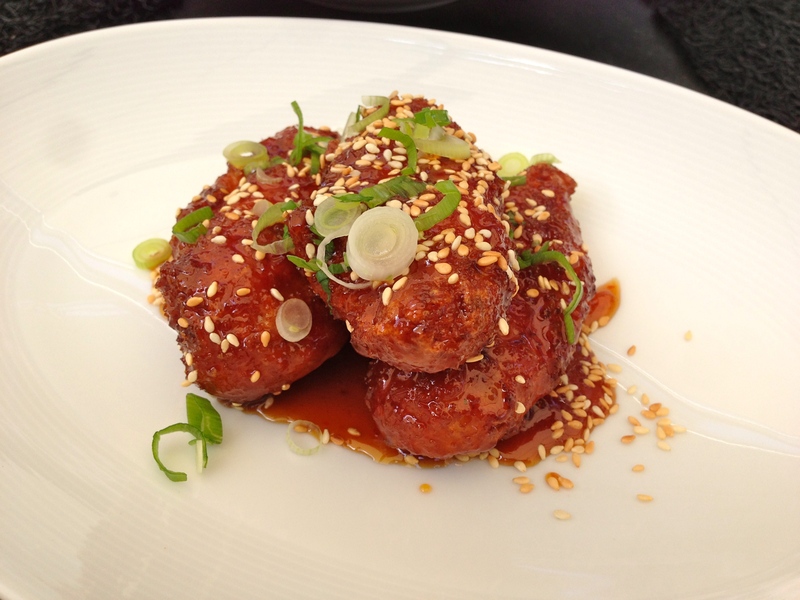 My favorite dishes were the hamachi, corn soup, and asian style chicken wings. Their signature dish, the hamachi sashimi, was the best dish of the meal with buttery pieces of hamachi fish (yellowtail) over sticky white rice, crunchy edamame (soybeans), and flavored with a sweet yet salty aromatic ginger soy sauce. The corn soup was rich in flavor with a velvety texture topped with airy corn fritters and sweet heirloom tomatoes, nothing beats heirloom tomatoes! Lastly, the asian style chicken wings were not only complimentary but were just how they should be, sticky, sweet, and with a touch of heat. Finger lickin’ good! Overall, I’d rate Redd at a 7.5-8/10 for scrumptious food in beautiful wine country.